Using our flexible directory builder, you can publish unlimited customizable member directories, complete with search criteria that you can tailor to your association’s needs and interests. Filter by chapters, industry, interest and virtually any field from our membership management software, and achieve truly effortless directory management. Whether you're creating business directories or a complete yet private member email directory for your members to access, choose from virtually unlimited layouts, formats and data sets. Add multiple sections and specify your own fields, including member photos. Publish your online directory right on our built-in website, or embed it on your own. Whether you prefer a card view or a list view, visitors can browse through directories in the format you choose. Prefer to hide certain fields from the public but make them available to members? Our custom directory view lets you tailor not just the look of the member view, but which fields to display per audience. 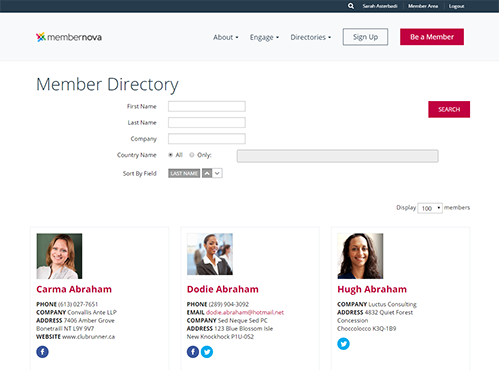 Whether it's a private member email directory, a public business directory for professionals servicing certain industries, or an official association member listing, MemberNova goes beyond ordinary association directory software. Tailor your search criteria using keyword searches, drop down options, and checkbox filters to allow people to find each other easily. 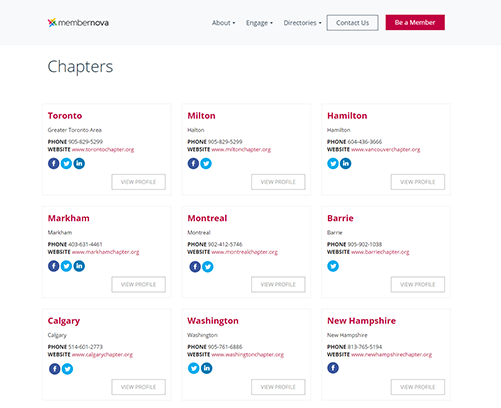 MemberNova makes it easy to publish chapter-wide directories, individual chapter directories, or filter a universal directory by chapters. Our flexible structures for organizational hierarchy extend to our directory module, making it easy for your association to publish your key contacts in the format you want. Directories aren't limited to members only - create a listing of non-member contacts and offer a searchable directory, whether password-protected or public, to offer value to your community or monetize your association's benefits. Choose to make certain directories visible by the public through your website, or secured behind a password-protected members-only area. Open up new benefits to your membership offerings by tailoring unique directories available to certain membership types, for instance, a professional service finder. Personalize the privacy levels by member and allow them to decide which fields are visible by the public. Allow each member to change their contact information as displayed internally by fellow members, or externally by the public, right from within our membership management software. Make it easy for visitors to your directories to get in touch with members through our built-in secure contact forms, which you can decide to open up on a per directory and per member basis. Perfect for professional service finders, you can even allow members to view all their inquiry requests within their member area, and track aggregate results to report back on. Contact us to learn how we can take your membership engagement and growth strategy to the next level.